Congratulations on making the decision to become part of an international programme for environmental education for sustainability. This is an exciting time for your school to join the 51,000 participating Eco-Schools worldwide, taking the challenge and working towards improving the local and global environment through education and practical action. The first step to becoming an Eco-School is registration, all schools in Northern Ireland are now registered with the Eco-Schools programme. Once registered, you will receive some introductory information by email, termly newsletters, an abundance of web-based resources and access to further support from our delivery partner organisations, local councils and government agencies. A willingness to take action to instigate long-term change. Before starting on the Eco-Schools Programme, please download and read our Eco-Schools Handbook. Once your school is registered with Eco-Schools Northern Ireland, you can begin to implement the Eco-Schools Seven Elements. Use the menu on the left to find out more about the individual steps. 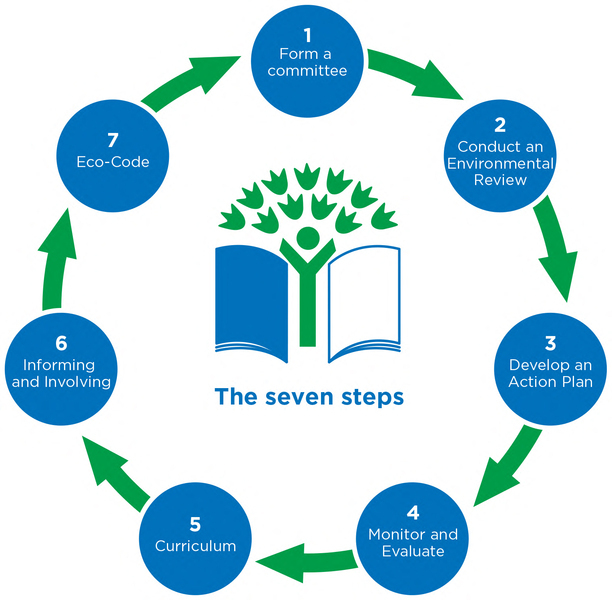 The Eco-Schools Handbook outlines the seven elements of the programme in detail. Please remember that you do not have to tackle all of the eleven topics in one go but a minimum of three topics - one major and two minor - must be covered for the Green Flag Application. The most important aspect for schools to remember is that every school is different and it is therefore critical that a school fits the seven steps around its circumstances and situation and NOT try and fit the school into the seven elements. Schools in Northern Ireland can choose from a menu of eleven topics when implementing their Eco-Schools work. Although all eleven topics must be included in the Environmental Review, schools can then decide which of the topics they will focus on. For Green Flag, the school must identify substantial progress towards one major topic and indicate involvement with two others. 'Identify substantial progress' means that the school has an understanding of the topic, recognises its importance to sustainable developments within the school environment and wider community, and implement change. Once a school has successfully implemented the Seven Steps, they are encouraged to apply for one of the three Eco-Schools awards: Bronze, Silver or Green Flag. The Award Criteria page provides full details of the criteria required for each award level. And finally above all else the Eco-Schools Programme should be fun.